A High Court judge has ruled that part of the government's legal aid reform in England and Wales is unlawful. 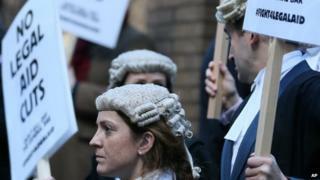 Lawyers challenged the reforms, which cut the number of contracts for duty solicitor work in magistrates' courts and police stations from 1,600 to 525. And Mr Justice Burnett ruled the consultation process had failed to let lawyers comment on two reports and was "unfair as to result in illegality". Ministers said they would consider the ruling but cost-cutting would continue. There are currently about 1,600 solicitor firms doing duty solicitor work in magistrates' courts and police stations, and in February the government announced plans to cut this to 525. The judge told Lord Chancellor and Justice Secretary Chris Grayling to scrap the plan and run the consultation again. BBC legal correspondent Clive Coleman said the decision was a "blow" for Mr Grayling and a "significant victory" for the two groups which brought the judicial review challenge - the London Criminal Courts Solicitors' Association and the Criminal Law Solicitors' Association. "They had long argued that the cuts are ideologically driven and would push the courts and justice system to breaking point," he said. London Criminal Courts Solicitors' Association president Nicola Hill said: "This is a great day for justice. "It shows that no-one, not even… Mr Grayling is above the rule of law." She said the reforms were being "sold in the name of austerity" and were being "railroaded through by a justice secretary determined to push through an ideology". She added: "The cuts have been nothing short of an assault on justice - compromising fair representation for people accused of a crime in police stations and courts." Mr Grayling has faced vehement opposition to legal aid reform from lawyers, including strikes and protests outside Parliament. The solicitors' groups also objected to cuts in criminal aid legal fees - an 8.75% cut already in force and a further 8.75% due to take effect in spring 2015. The judge rejected this aspect of the legal challenge, saying the groups had not established a "sufficient connection between the flaws identified in the consultation process and the decision to reduce fees". "The claimants failed in their challenge to the fee cut," a Ministry of Justice spokeswoman said. "However, the judgement has raised some technical issues about the consultation process, which we are carefully considering." She said the government would "continue to implement reform of the criminal legal aid system" to ensure it was "sustainable". "Even after reform we would still have a very generous system at around £1.5bn a year," she added.